T-Systems sponsors Wayde van Niekerk. 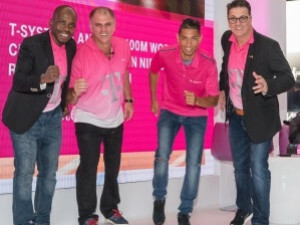 T- Systems South Africa is sponsoring 400m World Champion Wayde van Niekerk, a South African track and field sprinter who is renowned for his local and international achievements in the 100m, 200m, and 400m events. The sponsorship will see T-Systems South Africa support Van Niekerk to advance his athletics career and assist to launch the Wayde van Niekerk Foundation, an initiative founded by Van Niekerk that will support young South Africans to leverage their talent and create a better life for themselves. Says Gert Schoonbee, MD at T-Systems South Africa, "We identified a number of synergies that made this sponsorship so meaningful. Van Niekerk is a South African that studies, lives and trains in South Africa yet competes globally as well as locally and has achieved significant success in both areas. We at T-Systems are locally based with local shareholding, yet draw on our international parent company's expertise and experience. In addition, we both operate within very fine margins; Milliseconds can mean the difference between winning an international race and coming second. For T-Systems, meeting the criteria in our service level agreements (SLAs) is just as crucial. There is a significant difference between achieving 98% of our SLA and 95% for our customers. We are also both committed to enhancing the human experience and making a difference in peoples' lives." Says Van Niekerk: "When T-Systems approached me, offering its support and suggested alignment of our brands, it made perfect sense. Like T-Systems, I work with a strong local team that enables me to compete on a global level and I am committed to representing South Africa just as T-Systems is committed to delivering solutions and services that are tailored to the local market." Adds Schoonbee: "Our brand is further aligned with Van Niekerk and what he represents as he strives to win, sets new records and makes his mark in a field that is highly competitive. It takes hard work and discipline to be a champion athlete and requires much resilience. He also sets the bar for himself and this is exactly what T-Systems is doing. Van Niekerk is disrupting the status quo in the field of athletics with his achievements. Herein lies the parallel with T-Systems as we constantly strive to deliver disruptive solutions and services that underpin our customers' abilities to in turn, disrupt their markets." T-Systems understands that the market is shifting and new technologies such as cloud, mobility, big data and more are, together with increasing customer expectations, fuelling the need for companies to create a digitised environment. Digital transformation is crucial for companies to innovate and significantly reduce 'time to deliver' with new products and services. The cloud is instrumental in achieving this and T-Systems has recently launched a number of new solutions to assist their clients to migrate their infrastructure and applications to the cloud, reducing risk and guaranteeing impressive reductions in total cost of ownership (TCO). T-Systems has also defined a new approach to ICT products and services - referred to as un-outsourcer solutions - that challenges traditional models, further reduces risk and eliminates vendor lock-in. This game changing approach is disruptive in itself and resonates with Van Niekerk and his 'shake up' in the field of athletics. Schoonbee adds: "However, it is not only about winning nor is it all about technology. We believe that there is a strong connection with the 'human element' and this too is what our support of Van Niekerk represents. The purpose of technology is to make a positive impact on the human experience, whether it be work or personally related. Central to the ability to connect people, improve their service experience and more is digitisation. It transforms not only business but people's lives." "In addition, we are excited to be involved in assisting to establish the Van Niekerk Foundation." Deutsche Telekom is one of the world's leading integrated telecommunications companies with around 151 million mobile customers, 30 million fixed-network lines and more than 17 million broadband lines (as of 31 December 2014). The group provides fixed network, mobile communications, Internet and IPTV products and services for consumers and ICT solutions for business customers and corporate customers. Deutsche Telekom is present in more than 50 countries and has approximately 228 000 employees worldwide. The group generated revenues of EUR 62.7 billion in the 2014 financial year - more than 60% of it outside Germany. Deutsche Telekom considers the European business customer segment a strategic growth area. Deutsche Telekom offers small, medium-sized and multinational companies ICT solutions for an increasingly complex digital world. In addition to services from the cloud, the range of services is centred around M2M and security solutions, complementary mobile communications and fixed network products, and solutions for virtual collaboration and IT platforms, all of which forms the basis for its customers' digital business models. With approximately 47 800 employees worldwide, T-Systems generated revenue of around EUR 8,6 billion in the 2014 financial year.